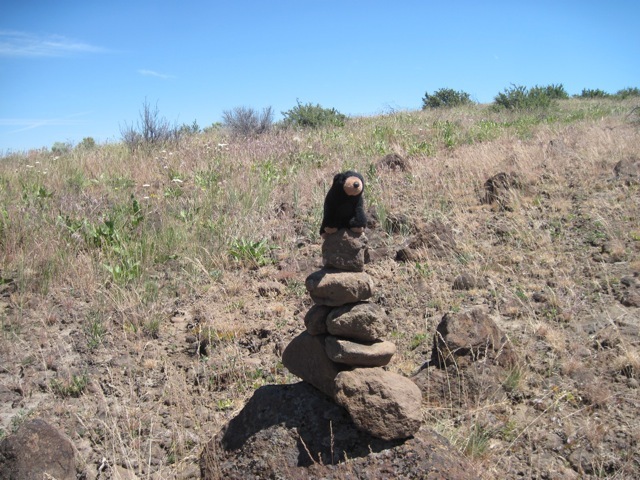 This cairn and its accompanying pal are on the Cowiche Mountain Loop Trail in Yakima County. The bear, known officially as Big Bear, exemplifies a key aspect of cairns, that animals regularly take advantage of them as a high point to observe the surrounding territory. According to our friends, Big Bear goes on most of the hikes they take, particularly if they can offer the prospect of a chance to see what’s on The Other Side of the Mountain. Or if there are huckleberries or blueberries to find. And a cairn is a good spot for such situations when you need to get up a little higher to see.